Vote, Vote, Vote, for Megan!! Okay, so for all you American Idol fans! Megan Corkrey is the one to vote for. She is the niece of Jamie who works in the shop, and we want her as the next American Idol. Not only that but she is a utah girl! So when the voting begins tomorrow please call in and vote for MEGAN!! Even if you don't watch you can still vote! PLEASE! Finally, We get our sign!! This has been a long time coming, we couldn't come to an agreement with the landlord (charming people) and if it weren't for a very persistent sign girl this might have never happened, but it may take a while to get it lighted! We had to have it lighted ""said charming landlord, but when they finished our building they didn't wire for a lighted sign! ugh! So, anyway the sign is up and it looks fantastic!!! Yea! to IG signs! see persistence pays!! So everyone load up the car and come see our beautiful sign!!!! 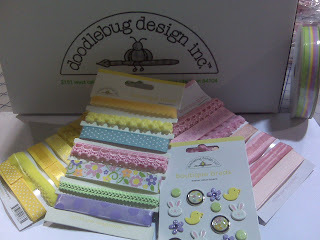 Doodlebugs comes to Material Girls!! Crazy for dots and stripes!!!! Material Girls loves polka dots, with all the fun colorways this comes in you are sure to find one or MORE that you can't live without. We just received this today and it is just a fun line, click on the link to see all the colors. Call me and I will pull your favorites! 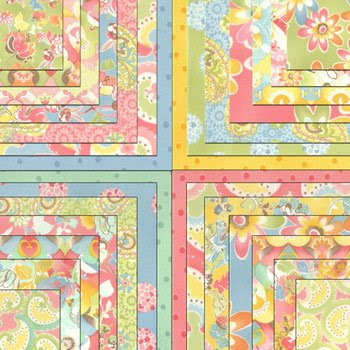 New Block of the month to start! 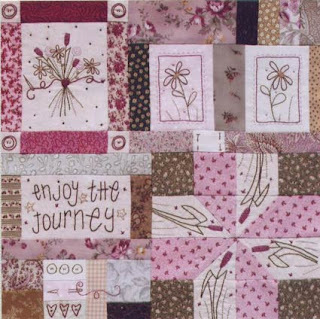 Quilter" and is alot of fun to do. 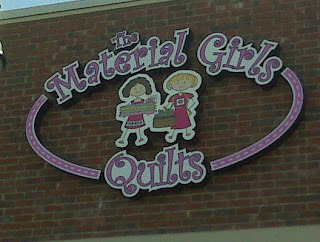 If you are interested please call the store as we have a limited supply of patterns and kits. I will be posting pics as we get the blocks done. Also we are having a BIG Presidents sale tomorrow so be sure and stop by! Okay, just so you know I put those pictures on that last post, all by myself, impressed? you should be, because right now I am telling technology "bring it on sister" I hope to add more tomorrow, Okay thats all for tonight!! These are just a few of the lines we have received, Soiree by Lila Tueller for Moda, Sweet by Urban Chicks, and Swanky by Moda, so cute and its going fast so hurry in, tommorrow in honor of the the little bare bummed cupid we are offering 14% off everything in the store!!! See ya Saturday!! Yikes! I have been MIA. The shop has been crazy busy, and we have received ginormous shipments everyday that are sure to make your tummy rumble with delight, and the hafta haves!!! WE received SWEET by Moda today, oh my is this a cute line.... and Riley by Anna Griffin, and much more, We also have lots of new models up and they are really great! I have been painting my house and trying to get organized (ugh!!) I have my cousins who are from England coming to spend some time with me for several months!! I am so excited but I have come to the conclusion that if you run a business, something goes to %$e?? in a hen basket, and in my case it is my house. So I am back to my blogging friends, (and Martha Stewart please contact me if you are reading this I need help) I was also extremly forgetful that I ran a contest so Cindy you left the first comment on my blog, please contact me and I will get your late prize out to you!! Sorry about the long post but I have a lot to say, I say more tomorrow!! !